Today’s post highlights the second instalment of my holiday look book and features my first purchases from Ready to Stare and the amazing woman behind this brand, Alysse Dalessandro . I have been following Alysse for almost a year now and my respect for her brand and mission has only continued to grow. I love that she is size inclusive and that she has a definite soft spot for us gals who are size 22+. I also appreciate the diversity in the models she uses to promote her brand. And I love a woman who stands up for herself and others who may not have the strength or courage to do so. I have seen the fat shaming and bullying that she has been subjected to and am truly amazed at her resolve and dedication. Ready to Stare pieces are definitely edgy and push outside the boundaries of what you would see anywhere else. I have always wanted to purchase something but have never found something that I thought would work with my style. That was until I saw the “Thank You For Staring” collection released earlier this fall. I immediately fell in love with the “Gold Metallic Skater Skirt”. The only problem was that this girl doesn’t do mini skirts! So I reached out to Alysse to see if I could get the skirt made in a longer length. To my delight, the news was good and I had my skirt custom made to 26 inches. The skirt is the most amazing rich metallic gold colour and the fabric is quilted which adds an extra element of interest. Being a skater skirt, the shape was perfect for my pear shape and I loved the fact that the waist didn’t have any elastic. It is a nice thick waist band that doesn’t dig in. I was very impressed with the quality of this garment, you could feel the love that went into it. And there was only a small additional charge to have this skirt lengthened. That is what I love about working with indie designers who will customize pieces to suit your needs. I got this piece made to my exact waist measurement in the length I wanted for much less than I pay for many of the pieces I buy from major retailers. So ladies I highly recommend that you consider shopping small business, I think you will find it to be a great experience. Besides ordering the skirt I had also decided to purchase the Ready to Stare logo earrings that had also just been released. I don’t typically wear big earrings but I liked the fact that these were made of light weight acrylic and I love the colours in the logo. These earrings are fantastic, they feel like nothing on your ears and they have so many great colours and will go with so many different pieces in my wardrobe. The earrings then became the inspiration for what I was going to choose to pair with this skirt. Purple is my absolute favourite colour and when I saw it in the earrings I immediately thought of the purple and gold velvet bags that Crown Royal Whiskey come in. I loved the idea of such a rich and vibrant colour combo. I also wanted to do something that wasn’t your typical Holiday colour scheme. The blouse is by Lane Bryant. A funny story about this is that I had not originally intended to wear it for this look, I had already chosen another purple top that I had in my closet. But I went shopping the day before my shoot and this was one of the items that I had ordered. When I opened up the package and I tried it on, I immediately knew that it was meant to go with this skirt. This blouse is actually a very versatile piece as although I am wearing it tucked in, it is actually a very voluminous asymmetrical tunic style that would also look great with a pair of slim dress pants or skinny jeans. I love the rhinestone detailed strap that provides a little extra glam and the richness of the fabric. I am wearing the size 26/28. It is a very generous cut so you could size down depending on how much volume you would like if you were wearing it loose. I decided to add a sparkly purple cardigan that I already had in my closet as an optional third piece to the look as it is chilly out these days and it would be perfect for travelling to and from parties. It also provides some coverage for anyone who wants to show less skin. I think that it added a bit of a retro feel to the look. To continue with the dramatic feel of this look I added a wide gold cuff bracelet from Avenue, my gold LB flats and a very unique clutch. 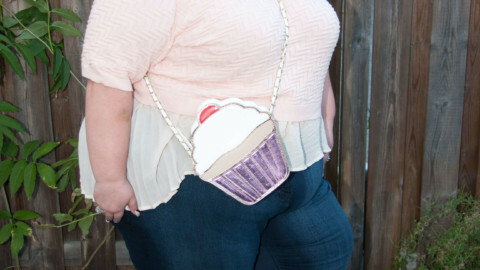 Those who know me know how much I love purses and clutches. Because of my struggles with shoes and wearing heels it has always been my way of adding something unique to my wardrobe. I have found over the years that you never know where you will find those unexpected treasures. I used to travel for work and one time I went out to Moncton New Brunswick. Moncton is not a fashion mecca by any stretch of the imagination but I had some time to kill at the airport and I wandered into this lovely little shop that had these beautiful bags. I loved the colour and the details such as the tortoise trim and the beading. And I think it was only $35! When I pulled it out of the closet and saw how it tied into the earrings and the rest of the look, my outfit was complete! I truly love this look, it makes me happy on the inside and that is priceless. So I am ready to do something fun and festive, who’s going to join me? Stef, of SassyPlus you did it again! Thank you!